Diana McCaulay is an award winning Jamaican writer and a lifelong resident of its capital city Kingston. She has written four novels, Dog-Heart (March 2010), Huracan (July 2012), both published by Peepal Tree Press in the United Kingdom, Gone to Drift (February 2016), published by Papillote Press from Dominica and the UK and the self-published, White Liver Gal (May 2017). Dog-Heart won a Gold Medal in the Jamaica Cultural Development Commission’s National Creative Writing Awards (2008), was shortlisted for the Guyana Prize (2011), the IMPAC Dublin Award (2012) and the Saroyan Prize for International Writing (2012). Huracan was also shortlisted for the Saroyan Prize for International Writing in 2014. Gone to Drift placed second in CODE's Burt Prize for Caribbean Literature in 2015, won the Vic Reid Prize for Young Adult fiction in Jamaica’s Lignum Vitae Awards (2016) and is shortlisted for the IMPAC Dublin Award (2018). The US rights for Gone to Drift were bought by Harper Collins in 2016 for release in 2018. Diana’s novels entice readers with the unique spirit and complexity of contemporary Jamaica. Dog-Heart is a compelling and dramatic story of one woman’s attempt to make a difference in the life of a young man from a disadvantaged community in Kingston, while Huracan, loosely based on Diana’s own family history is a part contemporary and part historical novel that tells the story of Leigh McCaulay, returning to Jamaica after 15 years in the US to make a home on the island. Although not a sequel to Dog-Heart, Huracan does explain the origins of the ghetto in her first novel and the nature of white guilt explored in her second. Ian Thomson, author of The Dead Yard: Tales of Modern Jamaica, described Huracan as follows: “Diana McCaulay has captured the bright tropic warmth, the violence and beauty of her birthplace like a born storyteller”. Diana's third novel, Gone to Drift, her first for young adults, tells the story of a boy’s search for his grandfather who is lost at sea. The novel explores fundamental choices facing Jamaican society and many developing countries: the casting away of traditional knowledge in the embracing of fast changing modernity, the challenges of surviving in an economy mired in debt and unemployment, and the pressures of an unequal society that forces people into daily acts of compromise and corruption. Harper Collins has bought the US rights for Gone to Drift, which will be published in April 2018. 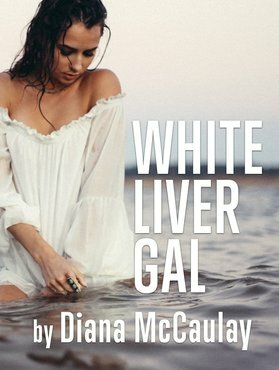 White Liver Gal, Diana’s newest novel, explores the traumatic legacies of sexual abuse over generations and the redemptive power of friendship between women. Diana founded the Jamaica Environment Trust (JET) in 1991 and stepped down as CEO at December 2017. In that position, she has interacted with all levels of Jamaican society from the Prime Minister and cabinet officials to rural Jamaicans displaced by development and fishers denied access to beaches. Diana’s writing contains an authenticity and vibrancy derived from her active participation at so many levels of Jamaican society. She was a popular newspaper columnist for The Gleaner (1994-2001) and her short fiction has been published by Granta Online, Eleven Eleven, The Caribbean Writer, Afro-Beat, Lifestyle Magazine and the Jamaica Observer’s literary supplement, Bookends. She won the regional Commonwealth Writers Prize in 2012, for her short story, The Dolphin Catchers. Diana was born into the Jamaican upper-middle class and has spent a lifetime pondering questions of race, class, colour, and privilege in Jamaican society. The honest and penetrating insights in her novels and stories come from sharp observation and profound self-reflection, and arise out of experiences similar to the ones she has written about. Hers is a uniquely authentic voice from a background which usually turns away from all that she unflinchingly faces.